One of the best things to happen in the world of wine, beer, and spirits is the popularization of home brewing. Even more, with home brewing, those with the skills and equipment can add their own personal tastes and preferences to the beer they drink and offer to friends and family, and even the public on a small scale. 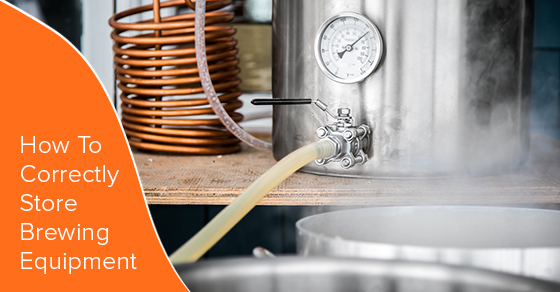 Brewing homemade beer, however, involves some pieces of equipment that come with special storage needs to ensure that they are always working correctly. If you are wondering about the best ways to properly store your brewing equipment when not in use, below are some tips to help you out. These storage options are especially useful for smaller items like spoons, thermometers, racking canes, and bottle brushes. Keeping these items off the ground and stored for easy access will make the brewing process that much more organized and enjoyable for you. Plastic shelving units are ideal storage spaces for larger pieces of equipment like fermenters. Keeping your fermenters off the ground, away from dust and debris, as well as any pests which might smell leftover sugar, yeast, or any other natural ingredients that attract insects and rodents is something that all brewers must do. Storing your raw ingredients properly means understanding the temperature and freshness needs of many of them. Malted grain and liquid malted grain should be stored between 50 and 70 degrees F, and hops and yeast should be stored in the fridge and freezer (respectively). These items should either be stored in the manufacturer’s’ packaging, or some other airtight container to avoid spoilage. Filing cabinets make a great and convenient storage space for unused bottles. Even better, opt for filing cabinets that you can then lock to make sure that no contaminants get in while your bottles are in storage. Home brewing is a great hobby that you can share with your friends and family, and you will definitely get better at it as time goes on and the trial and error periods yields something special. If you want your home brew to taste as good and fresh as it possibly can, and you want to keep the rodents and other pests out of your ingredients and away from your equipment, employ the above storage methods ensure that your home brew always tastes its best and is free of anything potentially harmful.